The unit I drove may have been a pretty "Light Ice Blue Metallic" color, but to Ford the Escape Hybrid is all green. And why not? Ford claims the Escape Hybrid is "the cleanest and most fuel-efficient SUV in the world," getting up to 41 U.S. mpg (5.7 liters/100 km in Canadian parlance) in city driving, which they say is 14 per cent better than the 2007 model and 80 per cent better in city driving than the V6 gasoline burning Escape. That's pretty good no matter how you slice it, especially in a time of high gas prices. I never achieve a vehicle's advertised mileage even if I make it a point to treat it as if I were the proverbial little old lady who only drives on Sundays (and who probably never existed anyway), but in my week with the Escape hybrid I put on just over 230 miles of both city and rural driving and it only cost me about $36 to fill the tank (at about $4.75 U.S. per gallon that week). It worked out to just over 30 mpg, which I'd call that a pretty good deal for an SUV. And I didn't make any special efforts to ameliorate the lead foot with which I was born; I gave up such thoughts after driving a Toyota Highlander hybrid so gently and carefully for a week I thought it would kill me - yet still didn't achieve the "rated" mileage. Which leads me to believe there is no real world perfect mileage. Ford likes to talk about the Escape's greenness as being more than just about gas mileage, though, stressing such points as its "all-new interior" featuring the industry's first "fabric seating surfaces made up from 100 per cent recycled material." Which makes it kind of like my jokes. Anyway, the Escape is a "full hybrid" that can run on the gas engine, the electric motor/battery power (up to about 30 mph), or both. And it does, seamlessly, with subtle gauges on the instrument panel letting you marvel at the system as it operates, letting you feel smugly secure in your environmental stewardship. The gas engine is a 2.3 liter four cylinder unit producing 133 horses @ 6600 rpm and, when combined with the 70 kilowatt electric traction motor, it really does feel more like a V6. It isn't going to set the world on fire when it comes to acceleration, but that isn't what hybrids are supposed to be about. Besides, I had no trouble keeping up with traffic in the Escape hybrid, whether it was when pulling away from traffic lights, merging onto freeways or just tooling along expressways. The suspension is independent all around and the hybrid features four wheel disc brakes with ABS. Juice flows back into the rear floor-mounted nickel-metal-hydride battery pack thanks to regenerative braking - though that may have also contributed to the rather spongy feel of the brake pedal. As with other hybrids, the transmission is continuously variable, treading the fine line between performance and economy, and it works well. 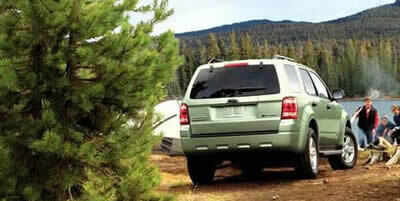 Power goes to either the front or all four wheels, depending upon which model you order. My test unit was the four wheel drive unit. The Escape is a tad boxy in an era of sleeker "crossover vehicles" such as Ford's own Edge and Mazda siblings CX-7 and CX-9, but it's hardly hideous and not nearly as brick-like as the Dodge Nitro, some Jeeps or any Hummer you'd care to mention. I didn't experience any problems with wind buffeting during my week, though we also didn't have any of the horrendous winds with which the Rocky Mountain foothills are blessed. The Escape hybrid's "new interior" is pleasant and comfortable, and features such "Ford-first features" as "Ice Blue lighting" that's quite attractive, a "top of dash information display" that reads out things like the temperature, date/time and the like, and newly designed radio and HVAC controls. The best thing about the center stack's interface is the big touch screen that lets you move from one audio source to another, control the various audio and video settings, etc. It also displays the navigation system's map, of course, though you still have to click through one of those stupid and annoying lawyers' screens to get at it. It's time Ford (and other companies) treated its customers like adults by getting rid of the mandatory click through - and to hell with the lawyers. The audio system sounds good and offers AM/FM/Satellite (though the satellite radio is optional and activated separately) with an auxiliary jack. HVAC controls are straightforward and give you dual zone heating and cooling. My test unit also featured the optional moonroof, and it's of a good size and the wind noise isn't excessively loud when it's open. My test unit also came with power windows and driver's seat cushion; the back is manually controlled, as is the entire passenger seat. My Escape hybrid's front seats also featured leather with bun warmers. The seats are comfortable, though it feels as if you're going to be thrown into the door or console when you hit a tight curve or corner. The steering wheel tilts but doesn't telescope and it includes cruise control buttons but no ancillary audio controls (though to be fair, the audio system is close enough at hand to be convenient anyway). There's good storage in the cabin, including split/fold rear seats that open up a big area in the back for hauling stuff. The glove compartment's a bit of a joke, though, mounted below a big and ugly airbag panel and offering barely enough room for the owner's manual. A handy touch is a tailgate you can raise either as a single unit or just via the glass section, which can be nice for loading and/or carrying long stuff. My test unit included power conveniences such as door locks, windows and the like. It also included options like the hybrid premium leather package which, besides upgrading the seating and steering wheel surfaces, also includes stuff like a 110 volt AC power outlet, heated outside mirrors and a handy rear parking sensor. It also came with the chrome appearance package that make it look, well, chromey. Safety equipment includes the usual assortment of bags, belts and latches. You get side curtain airbags with "roll fold" technology Ford says slides the bags between the window glass and the passengers as they inflate (the bags, not the passengers, hopefully) if said passengers aren't seated properly or are resting their heads against the window. There's also an anti-theft system and tire pressure monitoring. I ran into a minor snag with the Escape's monitoring systems. A couple of times, it warned us that the left rear door was ajar when it wasn't. A good slam of the door made the errant signal go away. It wasn't a big deal, but it shouldn't have happened. The Escape hybrid is very smooth and quiet on the road, and quite nice to drive - in a more truck-like way than some competitors on the road today. The overall impression I got of the vehicle is that it's comfortable and efficient, and pretty cheap on gas considering its size and cargo/people hauling mandate, but it also seems a tad long in the tooth and ready for replacement. Could there be an Edge hybrid on the way? 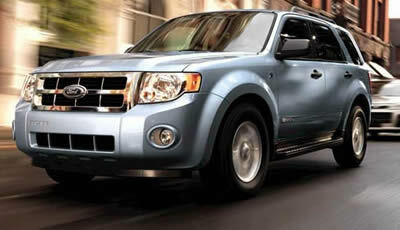 The 2008 Ford Escape Hybrid starts at $26,640 U.S./$31,499 Canadian. Jim Bray is a member of the Automobile Journalists Association of Canada. His columns are available through the TechnoFile Syndicate.